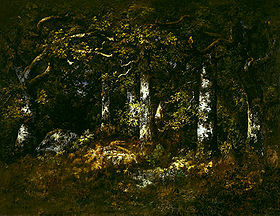 Narcisse Diaz de la Peña, Foret of Fontainebleau, 1868. Theodore Rousseau, Pond at the Edge of a Wood. Charles François Daubigny, Lavandières au bord de l'Oise, 1874. Paul Cezanne, Bord de la Marne, 1888. Claude Lorrain, Pastoral landscape with Lake Albano and Castel Gandolfo, 1639. Nicolas Poussin, Landscape with a Calm, 1650-1651. Classical Landscape with Figures and Sculpture by Pierre-Henri de Valenciennes, 1778. Camille Corot, Road to Sèvres, 1855-1865. Gustave Courbet, Château d’Ornans, 1855. The Beach at Sainte-Addresse by Jean-Frédéric Bazille, 1865. Edgar Degas, Sea landscape with sandy beach at low tide, 1869. French River Scene by Charles-Francois Daubigny, 1871. Alfred Sisley, Thames at Hampton Court, 1874. Pierre-Auguste Renoir, Paysage de Neige, 1870-1875. Claude Monet, Landscape At Vetheuil, 1880. Claude Monet, Landscape near Montecarlo, 1883. Claude Monet, Banks of the Seine at Jeufosse Clear Weather, 1884. Paul Gauguin, Boy by the Water, 1885. Paul Gauguin, Landscape Farmhouse in Arles, 1888. Paul Gauguin, Breton Boy by the Aven River, 1888. Armand Guillaumin, Mountainous landscape, 1895. Eugene Boudin, Etretat, la falaise Amont, 1896. Pierre Bonnard, Dauphine Landscape, 1899. Alfred Sisley, Langland Bay, Storr's Rock - Morning, 1897. Alfred Sisley, The Canal du Loing at St. Mammes, 1885. Jean-Baptiste-Camille Corot, Ville-d Avray, ca. 1867. Renoir, View From Cap Martin of Monte Carlo, 1884. Monet, Rock Arch West of Etretat (The Manneport), 1883. Monet, Boulevard des Capucines, 1873.